1. The beyond adorable North American Bear Company has SO many cute things for the kids in your life!! Truly, you can find something for every child (and maybe even some adults!) I especially love the Cutie Tattooie Shark which comes with a dozen tattly tattoos, not only for your kiddo but for their shark too, and I also adore everything in the Sophie & Lili Collection - my girls particularly love the Gigi Mermaid flip doll - she's a mermaid by day, and then you flip her fins up, and she's a little dreaming girl in her jammies by night. It's the cutest! You can find the North American Bear Company here: Shop // Instagram // Facebook (Word to the wise - they'll be closed for inventory December 15, so get your orders in NOW!) Bonus: take 20% off your entire order + get free shipping when you spend $25 or more with code GLITTER!! 2. The Kids Fire HD from Amazon is pretty amazing. I love that it's an actual tablet, not just a watered down kids game packaged to look like a tablet. I also love that parents can personalize screen time limits, set educational goals, and more. There are so many educational apps, as well as about a bazillion other apps that kids would love that they can play with, but you can control. Tony and I are seriously considering getting one for our girls this Christmas. 3. Skylanders action game. I was working in Leila's classroom and asked a couple boys what they wanted - ALL of them said Skylander stuff. (I've never heard of Skylanders, so these boys were very helpful!) I thought this game would be a good alternative to the video games that are also a part of Skylander. 4. The Goldie Blox Parade Float kit. I just love Goldie Blox - their idea is that they want to get girls building, and making and creating. You can read more about their mission HERE. 6. Anything from The Printed Palette! My girls love these clothes - they're comfortable, stylish, and unlike other clothes you can find. 7. This one is directly from my girls - The Annie for Target collection. They literally have every piece on their Christmas lists! The clothes are inspired by the new movie, and adorable! 8. A Lego Technic race car. This looks so fun! Not only do kids get to build this bad boy, but they get to make it race as well! Ok, there you have it. 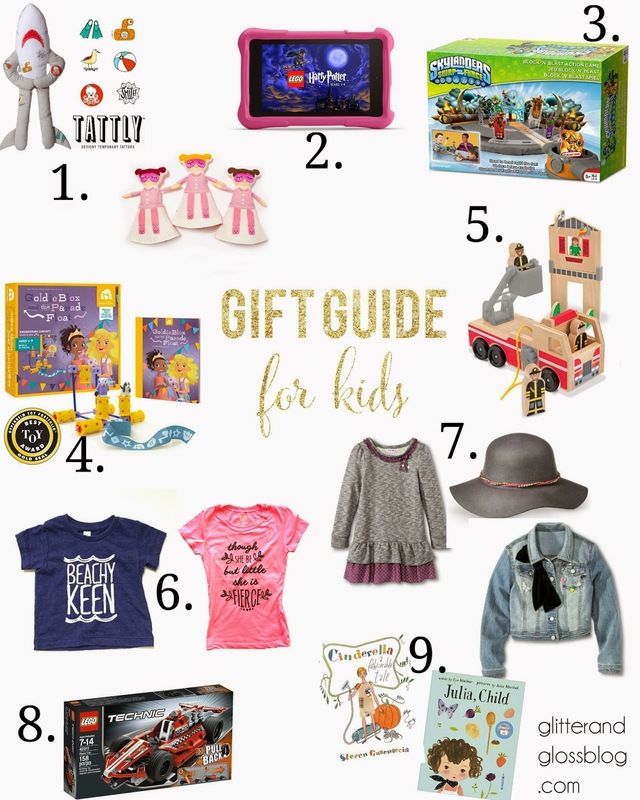 My picks on some of the best gifts for kiddos this season. (I know it leans heavily towards girls, and for that I apologize, but honestly, it's all I really know!) What are the kids in your life asking for?? I would love to know!